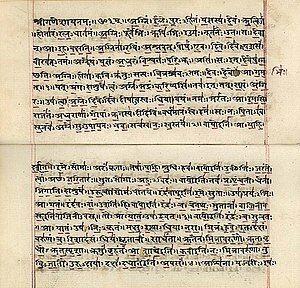 Sanskrit (/ˈsænskrɪt/; Sanskrit: संस्कृतम्, translit. 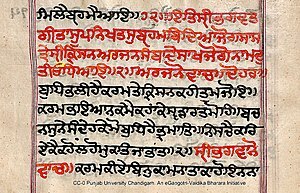 saṃskṛtam, Sanskrit pronunciation: [sɐ̃skɽɪtɐm] ( listen)) is a language of ancient India with a history going back about 3,500 years. It is the primary liturgical language of Hinduism and the predominant language of most works of Hindu philosophy as well as some of the principal texts of Buddhism and Jainism. 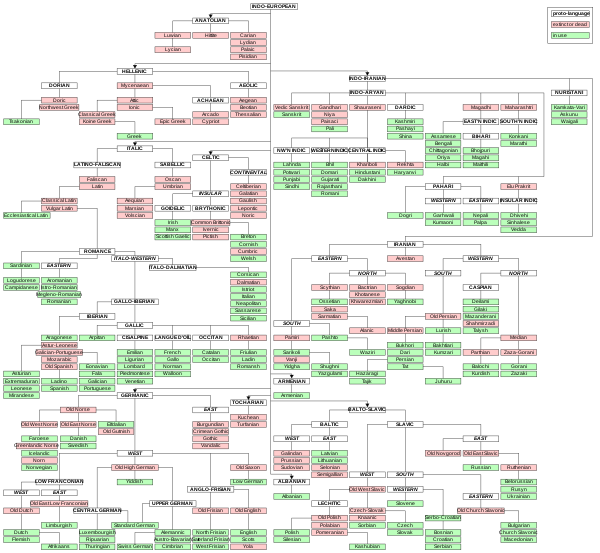 Sanskrit, in its variants and numerous dialects, was the lingua franca of ancient and medieval India. 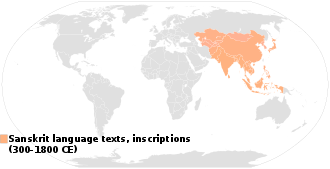 In the early 1st millennium CE, along with Buddhism and Hinduism, Sanskrit migrated to Southeast Asia, parts of East Asia and Central Asia, emerging as a language of high culture and of local ruling elites in these regions. The Sanskrit verbal adjective sáṃskṛta- is a compound word consisting of sam (together, good, well, perfected) and krta- (made, formed, work). It connotes a work that has been "well prepared, pure and perfect, polished, sacred". According to Biderman, the perfection contextually being referred to in the etymological origins of the word is its tonal--rather than semantic--qualities. 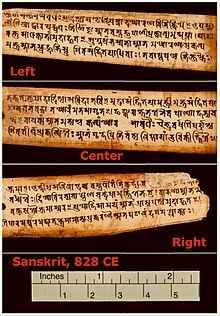 Sound and oral transmission were highly valued qualities in ancient India, and its sages refined the alphabet, the structure of words and its exacting grammar into a "collection of sounds, a kind of sublime musical mold", states Biderman, as an integral language they called Sanskrit. From the late Vedic period onwards, state Annette Wilke and Oliver Moebus, resonating sound and its musical foundations attracted an "exceptionally large amount of linguistic, philosophical and religious literature" in India. Sound was visualized as "pervading all creation", another representation of the world itself; the "mysterious magnum" of Hindu thought. 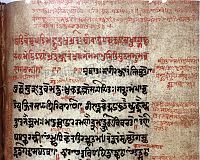 The search for perfection in thought and the goal of salvation were among the dimensions of sacred sound, and the common thread that weaved all ideas and inspirations became the quest for what the ancient Indians believed to be a perfect language, the "phonocentric episteme" of Sanskrit. The meter-feature of the Sanskrit language embeds another layer of communication to the listener or reader. A change in metres has been a tool of literary architecture and an embedded code to inform the reciter and audience that it marks the end of a section or chapter. Each section or chapter of these texts uses identical metres, rhythmically presenting their ideas and making it easier to remember, recall and check for accuracy. Authors coded a hymn's end by frequently using a verse of a metre different than that used in the hymn's body. 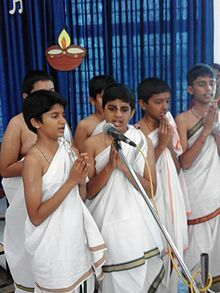 However, The Hindu tradition does not use the Gayatri metre to end a hymn or composition, possibly because it has enjoyed a special level of reverence in Hinduism. 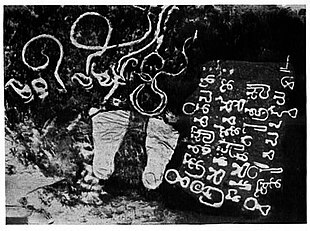 ^ Salomon illustrates this for the consonant ka which is written as " " in the Brahmi script and "क" in the Devanagari script, the vowel is marked together with the consonant before as in "कि", after "का", above "के" or below "कृ".